Leslie Allen Jordan (born April 29, 1955) is an American actor and playwright from Chattanooga, Tennessee. Leslie was born in Memphis, Tennessee and later moved to Chattanooga, Tennessee. Jordan has discussed his early life in Chattanooga, saying that he had a difficult time with religion growing up in the South and that he was baptized 17 times. Whenever the preacher would ask if anyone had sinned, Leslie would always think of something and come forward even when his mother thought he was overreacting about the situation. During an appearance on Today with Hoda Kotb and Kathie Lee Gifford, Jordan discussed his personal life and career. He described his mother, Peggy Ann, as being supportive and accepting though never truly understanding him. When asked about his mother he said that she was a very private woman and that she still lives in Chattanooga. Jordan's father was a lieutenant colonel in the United States Army and he died in a plane crash when Jordan was eleven. Jordan left Tennessee and arrived in Los Angeles in 1982. During this time he became involved with alcohol and other drugs and was arrested many times. When Jordan was seventeen years old, he started to write in journals every day. He said that writing in his journals helped him with recovering from drug and alcohol abuse. Jordan became involved in volunteer work. "Early on in the AIDS crisis, Jordan became involved in AIDS Project Los Angeles (APLA) as a buddy and as a food delivery person for Project Angel Food." Jordan has made numerous appearances in both film and television. He is recognizable for his diminutive size and Southern drawl. He appeared as a newspaper editor named Mr. Blackly in the popular movie, The Help. He is best known for his television work, including guest appearances on Will & Grace, Lois & Clark: The New Adventures of Superman, Star Trek: Voyager, Caroline in the City, Reba, Boston Public, Boston Legal, Nash Bridges, American Horror Story and his secondary role on Hearts Afire. He guest-starred on the comedy-drama Ugly Betty as celebrity-trasher Quincy Combs. In 2007, Jordan starred as Jesse Joe in the short-lived CW television program Hidden Palms. He also portrayed the ski patrol director in Ski Patrol. He is best known for his role as Karen's pretentious, sexually ambiguous rival Beverley Leslie on the series Will & Grace. For that role he received an Emmy Award for Best Guest Actor in a Comedy Series at the 58th Annual Primetime Emmy Awards in 2006. Because Jordan won the award for Best Guest Actor in a Comedy Series, he was invited to present the awards for outstanding comedy writing and outstanding comedy directing at the 2006 Emmy Awards with Cloris Leachman a week later. Jordan starred in the pilot episode of Laugh Out, the world's first interactive, gay-themed comedy show. On August 18, 2014, Jordan became a housemate in the celebrity edition of the British reality game show Big Brother. He was the second person to leave the Big Brother house (August 29, 2014). In January 2015, Jordan guest starred in the British sitcom Benidorm for two episodes as the character "Buck-A-Roo". Jordan is an accomplished stage actor and playwright. In one of his best-known performances onstage, he played Earl "Brother Boy" Ingram in Sordid Lives, a role he took to the big screen in the popular cult film of the same name. Jordan reprised the role in the Sordid Lives: The Series, a televised spin-off of the movie airing on Logo where he plays a character that is in a mental hospital. He wrote and starred in the autobiographical play Lost in the Pershing Point Hotel, which was also made into a motion picture. He recently toured the country performing his one-man stage comedy, Like a Dog on Linoleum, to generally favorable reviews. Jordan's first one-person show was called Hysterical Blindness and Other Southern Tragedies That Have Plagued My Life Thus Far. Next, he distilled his experiences growing up as an effeminate tiny boy in the Southern United States and in show business into an autobiographical one-man show, My Trip Down the Pink Carpet. During the opening of My Trip Down the Pink Carpet, Jordan's microphone stopped working but he kept on with the show like nothing happened and his show was a success. After touring the nation for several months with the production, the show opened off-Broadway at the Midtown Theater on April 19, 2010. The show is produced by Jordan's friend, actress Lily Tomlin. Jordan announced on The Paul O'Grady Show that he will be bringing his show to London's Apollo Theatre. TV series 1996 Star Trek: Voyager Kol Episode: "False Profits"
Terry is the jeweler from the rings. TV series 2007 Ugly Betty Quincy Combs Episode: "Punch Out"
TV series 2013 Baby Daddy Edwin the Mall Elf Episode: "Emma's First Christmas"
TV series 2014 Partners Marion Phillips Episode: "Jurist Prudence"
1 2 3 4 "Leslie Jordan Biography". TV.com. ↑ Middleton, Josh (12 March 2014). "GIRL TALK: Gossiping With Southern Baptist Sissies Star Leslie Jordan". Philly Magazine. Retrieved October 13, 2014. ↑ Duerst, Austin (16 October 2012). "Funnyman Leslie Jordan reflects on 'The Help', 'Will & Grace', 'Ski Patrol' and one-man comedy shows". isthmus.com. Retrieved 31 July 2015. 1 2 3 Freeman, Chris (2009). "Leslie Jordan: from small screen to big stage". 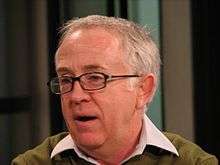 ↑ "Emmy-Winner Leslie Jordan Headlines Tuesday Night Live May 15". 1 2 "Atlanta Entertainment Company to Produce Innovative, Interactive Gay-Themed Comedy Show". prnewswire.com (Press release). Atlanta. 2 May 2015. Retrieved 31 July 2015. ↑ Jordan, Leslie (2008). My Trip Down the Pink Carpet. Simon and Schuster. ↑ Parks, Tim (17 August 2006). "The 'Sordid Lives' of 'Southern Baptist Sissies". The Gay and Lesbian Times. Retrieved 2008-04-08. ↑ Nichols, David C. (15 October 2004). "'Dog on Linoleum' finds firm footing". Los Angeles Times. Retrieved 2 April 2014. ↑ Helbig, Jack (11 August 2005). "Like a Dog on Linoleum". Chicago Reader. Retrieved April 2, 2014. ↑ Drake, Sylvie (1 July 1986). "Stage Review : 'Found A Peanut' As Child's Play". Los Angeles Times. Retrieved October 31, 2013.